A Christmas card from my Grandparent’s ( Mershell and Fannie Graham) collection, date unknown. I read on a post by Pauline on Family History Across the Seas about the people who sent Christmas Cards. It started me thinking about the cards I had from my grandparents collection with photographs of people I only knew were friends of the family, but nothing else about them. I wondered what I could find out. I picked this one out because, unlike some of the others, it had a name and a street address, although there was no date and no city. My grandparents lived in Montgomery, AL before moving to Detroit in 1919, so I started there. Here is what I learned from the census and Montgomery Directory about Addie Smith. Addie Smith “Ma Smith” is written on the shingles near her face level. 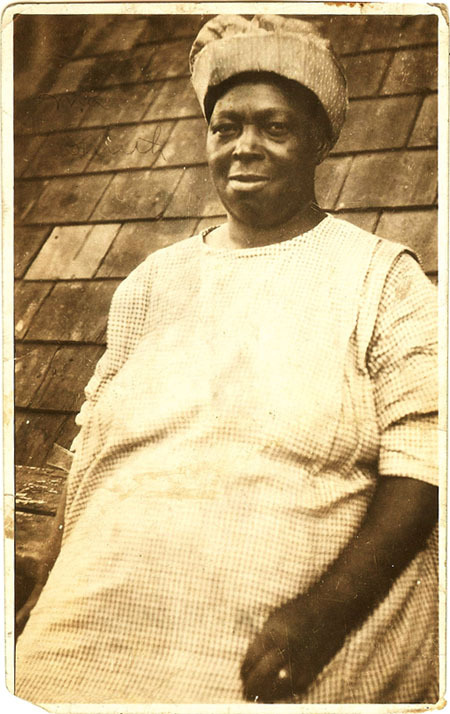 Addie was born in 1869 in South Carolina to parents also born in South Carolina. In 1888, (the year my grandmother was born), Addie married Fountain Smith, a laborer about 14 years her senior. This was her first marriage. Fountain may have been married before. They had no children. 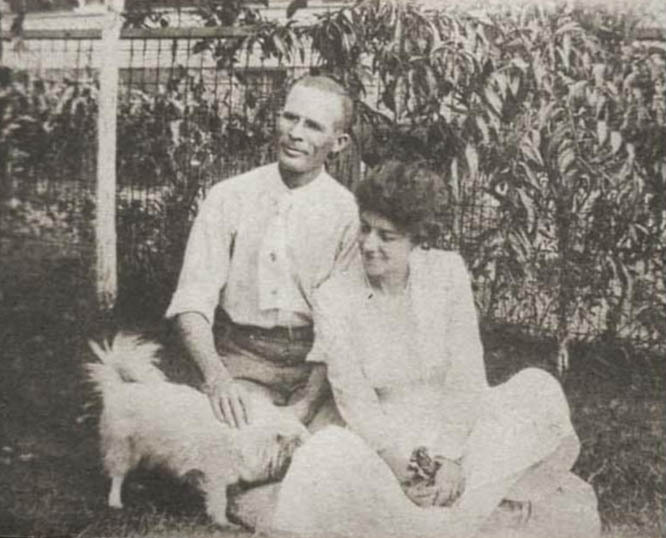 By 1906 Fountain and Addie were living at 105 Hutchinson Street in Montgomery. She would live in this rented house for the rest of her life. A Fountain Smith filed for bankruptcy in 1906. Over the years Addie Smith worked as a char woman/janitress in the Post Office. She may have also worked in that capacity in other public buildings. At 53 years old, on October 26 in 1922, Addie Smith died. 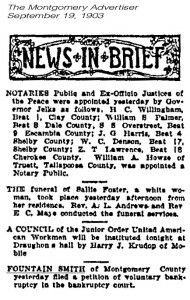 She is buried in Oakwood Cemetery in Montgomery. Fountain lived another 8 years, dying on November 3, 1930. He would have been about 62. 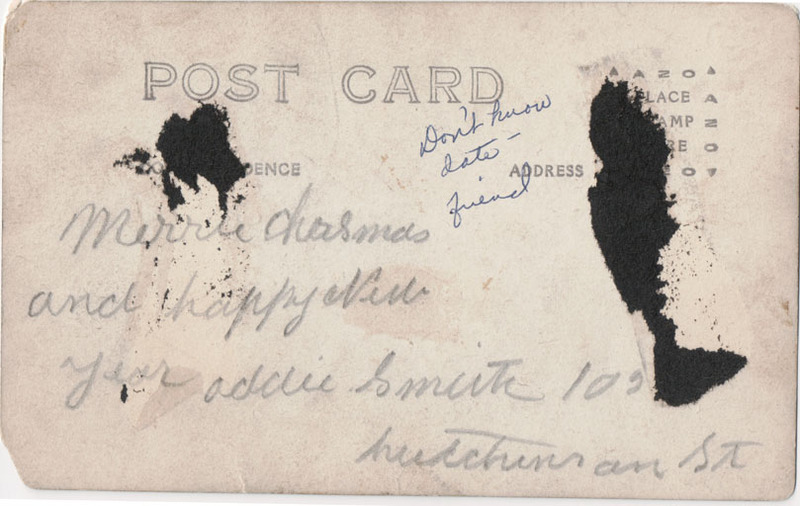 Because Addie died in 1922 and my grandparents moved to Detroit in 1919, I am guessing that this card was sent in 1920. My grandparents Fannie and Mershell Graham soon after their marriage in 1919. Looking at a map of the 4th Ward in Montgomery in I found that Hutchinson street no longer had houses below #800, However, my great Uncle Victor Tulane had a grocery store at Ripley and High street. My grandmother Fannie managed the store for a number of years before her marriage. This store would have been several blocks from Addie and Fountain Smith’s house. I am supposing that this is how they met. I wonder if our relatives crossed paths? I love Addie’s face and her ring. Your family stayed in her memory and heart for her to be sending that card all the way from Down South. Great Memory. True! Did your family live in Montgomery too? I was researching with someone once and turned out our families lived right next door to each other at one point. Was it a common practice to send a photo Christmas card at that time? Is there some writing on the left of her face? She has a very calm and peaceful face. Merrie Christmas to you and your family- enjoy the holiday season. It says “Ma Smith” up there on the shingles. I have one other postcard Christmas greeting from 1920 but there was no name and no address so I couldn’t look for her. I do have other photograph postcards from that time that aren’t Christmas. And Merrie Christmas to you Too! So glad you took the time to find out a little bit about Addie, and that you shared your find with us. So am I. I would have liked to trace her back to her parents but not finding her maiden name, I couldn’t. I love this, Kristin. Meeting Mrs. Smith adds so much color, texture, life to your grandparents’ story. You are rebuilding a community. You know, you’re right. When I look back at the posts I wrote about my grandfather’s friends in the migration series, the nurse and I have another few photos I haven’t written up yet. Where is your grandfather Mershell Graham from? He resembles my grandmother’s paternal side. 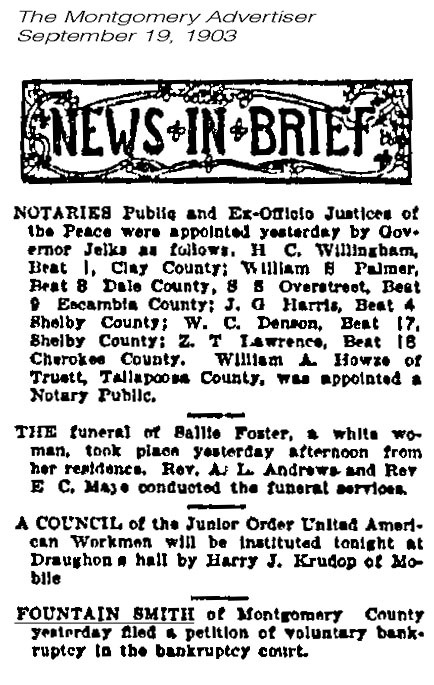 They were from Wilcox County Alabama, lived in Oak Hill, Camden, and Allenton. Surname: Andrews But I have no clue who else they might’ve been related to. Mershell Graham was born in Coosada Station, Elmore county, AL. I can’t find him before 1910 when he was grown and working on the railroad. I wrote more about him here http://findingeliza.com/archives/10951 and here http://findingeliza.com/archives/10844 I wish I could find some connection somewhere!! We also get many cards with friend’s photos on them. I must remember to write the year on them! And how you know them! Addie looks like someone who could give a good hug. She has such a wonderful face. I too like Annie’s face, a warm, peaceful and friendly face. I can imagine her coming into the store to buy floor, sugar and eggs to bake a cake. That looks like a strong and determined woman. Addie has been immortalised by your blog! A wonderful photo and I like how she looks directly at the camera. Who do you think might have taken the photograph? In the old days when letters and cards were the only connection for friends separated by distance, these cards had a special value. My grandmother saved all her Christmas cards and other holiday greetings, but now I have them and don’t quite know what to do with them. I wish some were as memorable as Addie’s greeting. I have no idea who would have taken the photo. Wish I did. I imagine it would have been quite expensive to have photo postcards made back in 1920, and once you had had a batch made you might have used them sparingly. I wonder how common it was to send Christmas cards at that time, and how many people would typically send out? Perhaps this wasn’t the Christmas card Addie Smith sent out to everyone that year (perhaps she didn’t send many others at all), but she sent this special photo card to your grandparents because they had just moved away and she wanted to wish them well in their new home and have something to remember her by. I don’t know how expensive it was. There are several postcard photos in my grandparent’s collection. This one was a postcard, but it must have been enclosed in an envelope because the address isn’t on the card. I do wonder how often people exchanged cards back then. This is a great idea, and you have me thinking of checking out a few of my own as well. I remember that my grandmother was one of the first to send photos like that too, then her daughter. What a lovely, respectful post about Addie. Well done. What a great idea! Now I want to copy you. Maybe next year …. Next Christmas seems so far away right now, but before we know it, it’ll be here! Good to see you couldn’t resist temptation Kristin 😉 Thanks for the mention. It’s interesting to conjecture how our family met friends, as with Addie. What an engaging face she has, meeting “yours” so directly. I’m glad you could find out more about her. they were both so young when they died, Addie and Fountain. Fabulous post – how terrific that you could find out so much about Addie! I love having a little bit of information and being able to find more. If only the marriage record and the death records had been available online, I might have found her parents and been able to take it back further.